AI has become a buzzword, that makes a lot of marketing experts underestimate the value, that machine learning, computer vision, and technology advance can bring into real estate marketing. But anyway, every day your marketing team suspends using innovative solutions in your marketing process, you are losing a competitive edge. We understand, that it might sound too dramatic. 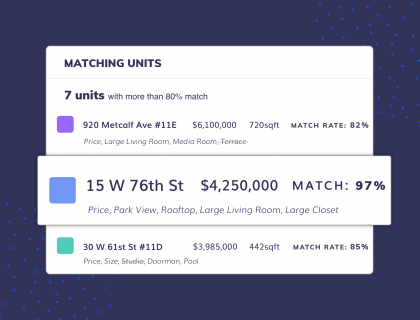 But the goal of this post is to explain how to adopt AI-powered tools and get the most value for real estate marketing. Different AI systems continuously work on the background of products and services we use every day, such as Amazon, Facebook, Netflix and, of course, Google. During the last few years, Artificial Intelligence has floored its way deeper into marketing, helping different brands to enhance every step of the client journey. 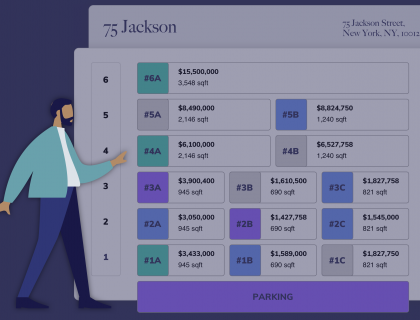 Furthermore, tools that previously were available only to large enterprises have become more affordable and accessible to medium real estate brokerages or small teams. At Propertymate we believe that every property is unique, as well as a person that is buying or leasing it. And we enhance these unique qualities making AI-powered tools for real estate agents and developers that helps them to understand better their clients and match them with all properties on the market. 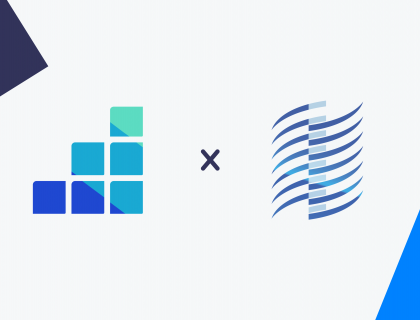 Below, we shortlisted a few use cases that real estate marketing team can implement using Propertymate’s AI-powered tools. In today’s world, your clients have developed high expectations for a personalized experience. Real estate marketers need to understand their audience and deliver the right messages, at the right time. The only way to achieve this is customer segmentation, but unfortunately, marketers can’t always rely on the agent’s manual data input. Propertymate enables real estate marketers to separate their customers into different personas and understand what they want. With these insights, marketers can focus on the specific needs of their audience and creating a better relationship with the brokerage. By the way, segmentation is also a vital part of the sales process. Previously, we wrote a post on the value of AI for real estate sales. Usually, real estate marketing team spends hours compiling and scheduling weekly emails to multiple (or one) client segments. Even with smart subscriber segmentation, that is available in email marketing products like MailChimp, you can not deliver a personalized email to each lead. Also, according to Demand Metric research, 80% of marketers consider customized content as more effective. That’s when Propertymate enters the game. Our matching technology can map a buyer profile to understand all the individual’s preferences of each contact. 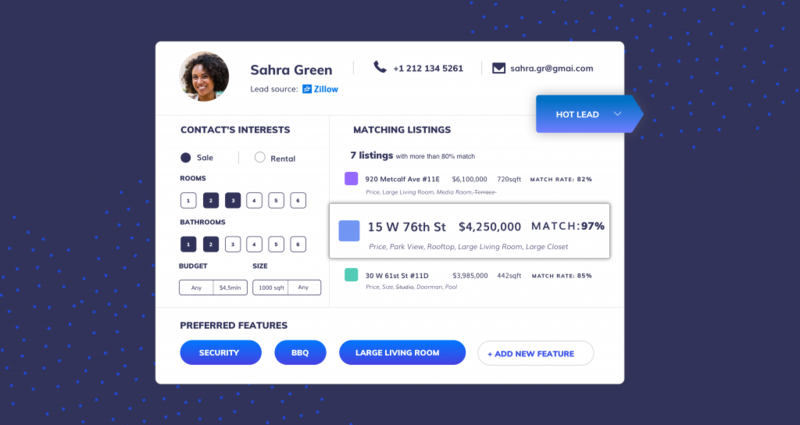 Integrating this information with your listing management system and email marketing tool, Propertymate can personalize email marketing for each of your contacts to improve relevant metrics such as click-through rate(CTR). Most real estate marketers allocate their PPC budgets from portals like Zillow to Google AdWords and Facebook Ads. Most of the ad campaigns are managed by marketing agencies or in-house teams. But as in the case with email marketing, personalization is a king. And as you probably know, personalization on a large scale is a hard goal for humans. Propertymate can help you uncover new opportunities that may not be used by your competition. First of all, Propertymate helps you to optimize targeting. Using information generated by our matching technology, you can optimize the processes of targeting and content creation. And instead of using boring retargeting and showing your leads listings they already saw, you can show them something they will most likely find interesting. Utilizing all tools mentioned above you can streamline all insight in easy-to-export reports, that allow you to analyze and change campaigns according to data insights. By the end of the day, feedback and analysis allow us to make better decisions and get better results. Artificial Intelligence enables real estate marketing managers to achieve a goal previously considered impossible – to communicate with every individual client in a meaningful and personalized way. Marketing personalization is a tool that can help you improve all of your metrics and deliver higher business results together with powerful brand awareness. In Propertymate we are continually searching for new technology application, to make the work life of real estate marketers and agent more comfortable and impactful. If you have any real estate marketing issue, you want to solve, or you are excited about the possibility of integrating AI into your marketing process don’t hesitate to reach out to us at team@propertymate.ai. 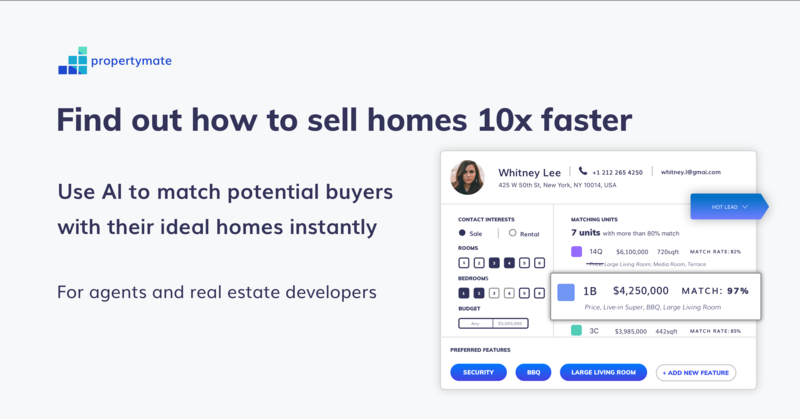 Propertymate is the AI-powered tool that helps real estate agents and developments to sell homes faster.